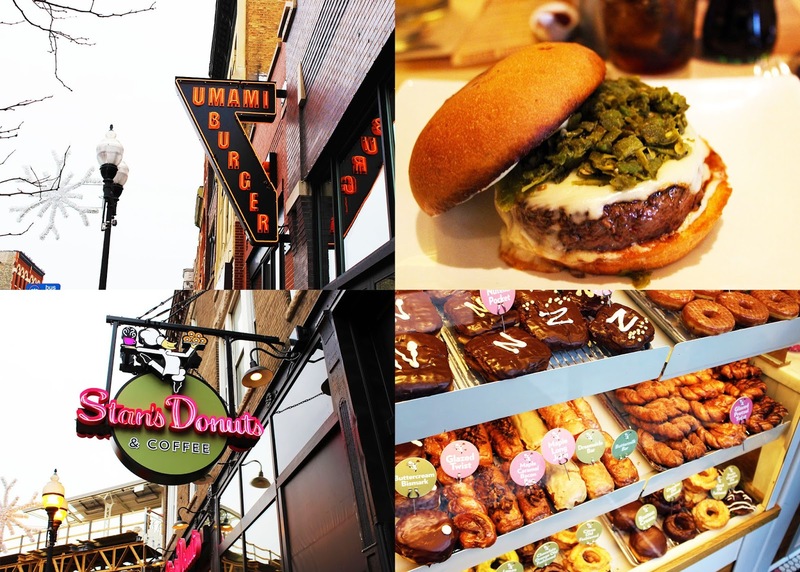 Miss Singh: UMAMI BURGERS AND STANS DONUTS! I have been in a burger mood lately! I don’t know what it is about the winter but I’m always ready for a warm juicy burger. I have heard so much about Umami burger in Wicker Park (Chicago) and had to give it a taste. Wicker Park is one of my favorite neighborhoods in Chicago and they have a bunch of amazing restaurants. Umami burger started in Los Angeles and after just five years of explosive growth, landed in Wicker Park in late September. Umami Burger's are freshly ground steak burgers with a secret proprietary tamari- and miso-based "Umami Sauce," and a dust likely made from ground dried porcini mushrooms and fish heads. The burgers are unique because they have a bunch of unique toppings that are absolutely delicious. For starters we got the fried pickles, which are amazing and especially at Umami. Topped with some jalapeño ranch and shaved Parmesan, the pickles were just a perfect start to some juicy burgers. We also got their famous thin fries topped with truffle cheese. I ordered the hatch burger, which had roasted green chiles, American cheese and roasted garlic aioli. It was a perfect mix of spiciness and cheesiness. I also loved the fact that they had their homemade special sauces which gave a unique taste to everything! My sister ordered the Ahi tuna burger, which is a no beef burger with seared sushi-grade, hand-chopped ahi patty, daikon sprouts, crushed avocado, gingered carrots, wasabi flake and wasabi tartar. It’s a great option for those non-beef eaters who are still in the mood for a good burger. The burgers are so juicy and melt in your mouth. I highly recommend Umami because the food, service and vibe are the bomb.com and you have to try it out if you're in Chicago or in the Wicker Park area. Any donut lovers out there? Because we were in Wicker Park, we decided to stop by at our favorite donut place in the city, Stans Donuts. Stans literally has every flavor of donuts you could imagine and they taste phenomenal. If you are someone like me and you are obsessed with donuts, you would love this place. The donuts are fresh, soft and moist(mouthwatering!) I love the Nutella pocket ones which are heavenly(they are the ones with the big N's )! Have you tired Umami Burger and Stan's Donuts ? I hope you guys enjoyed! I am a foodie and love to try new places, so if you have any recommendations, leave them in the comments down below! Gotta try these out when I come next...yummy!!! Oh my, the burger with some ham and salad looks amazing, I must say I have never seen such good looking burger in my country ^^! Cécile! The burgers were amazing! Ohh, this really just made me hungry. Looks delish! Hahaha I know what you mean!!! Hmm this looks all so good! Yummy! I'm so hungry now after reading your post. I used to eat at Umami when I was living in California but they don't have it anywhere here in Hawaii where I live now! Can't wait to visit home so I can eat some truffle burgers! Thank you! :) It was awesome!! Thanks a lot! I am glad you enjoyed! It was Jules!! They are the bomb.com! :) Thanks for reading!